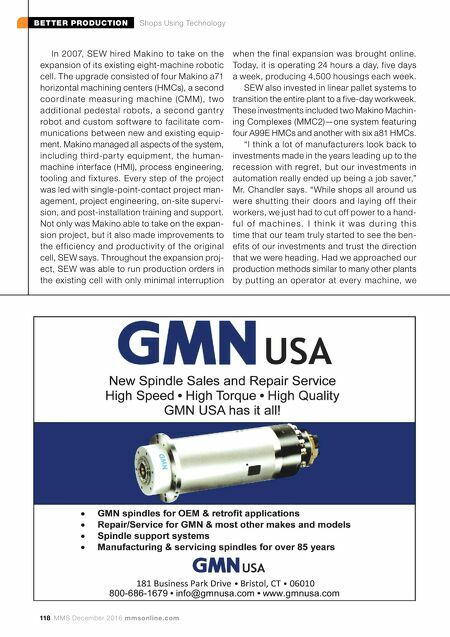 BETTER PRODUCTION Shops Using Technology mmsonline.com December 2016 MMS 119 would have had to lay off 50 percent or more of our staff." 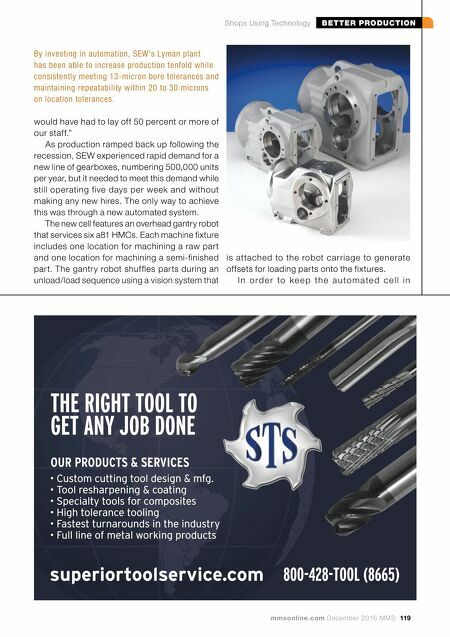 As production ramped back up following the recession, SEW experienced rapid demand for a new line of gearboxes, numbering 500,000 units per year, but it needed to meet this demand while still operating five days per week and without making any new hires. The only way to achieve this was through a new automated system. The new cell features an overhead gantry robot that services six a81 HMCs. Each machine fixture includes one location for machining a raw part and one location for machining a semi-finished part. The gantry robot shuffles parts during an unload/load sequence using a vision system that is attached to the robot carriage to generate offsets for loading parts onto the fixtures. I n o r d e r t o k e e p t h e a u t o m a t e d c e l l i n superiortoolservice.com 800-428-TOOL (8665) • Custom cutting tool design & mfg. • Tool resharpening & coating • Specialty tools for composites • High tolerance tooling • Fastest turnarounds in the industry • Full line of metal working products OUR PRODUCTS & SERVICES THE RIGHT TOOL TO GET ANY JOB DONE By investing in automation, SEW's Lyman plant has been able to increase production tenfold while consistently meeting 13-micron bore tolerances and maintaining repeatability within 20 to 30 microns on location tolerances.